The world map depicts Eurasia, a single landmass and largest continent on the planet, covering about 52 million km². The continent 'sits' on the Eurasian tectonic plate. Eurasia is subdivided by convention into Asia and Europe, separated from each other by the Caspian Sea, the Ural River, and the Urals (the Ural Mountains). The Ural mountain range runs from the coast of the Arctic Ocean southwards through western Russia. North(ern) Africa, West(ern) Africa, East(ern) Africa, Central Africa, and Southern Africa. The continent is shared by 54 countries. The Americas consisting of North and South America and the islands of the Caribbean. North and South America are geologically separate continental masses. plate tectonically, a portion of eastern Russia (eastern Siberia) is actually part of the North American plate. Mainland North America is home to four countries: Canada, the United States, Mexico, and also Greenland belongs geographically to North America. North America is connected to South America by the Isthmus of Panama, a landbridge between the Caribbean Sea and the Pacific Ocean. and in east by the Brazil Current of the South Atlantic Ocean. With an area of 17.8 million km² it is number four in the short list of the largest continents. South Pacific Ocean, and in east it adjoins the African plate. therefore it is still smaller than the area of Europe with about 10.2 million km². Australia travels together with the island of New Guinea on the Australia tectonic plate. the southernmost point on the surface of the Earth and the hub, one of the two endpoints of Earth's rotation axis. Antarctica has its own tectonic plate, named the Antarctic plate. keywords: how many continents are there in the world? 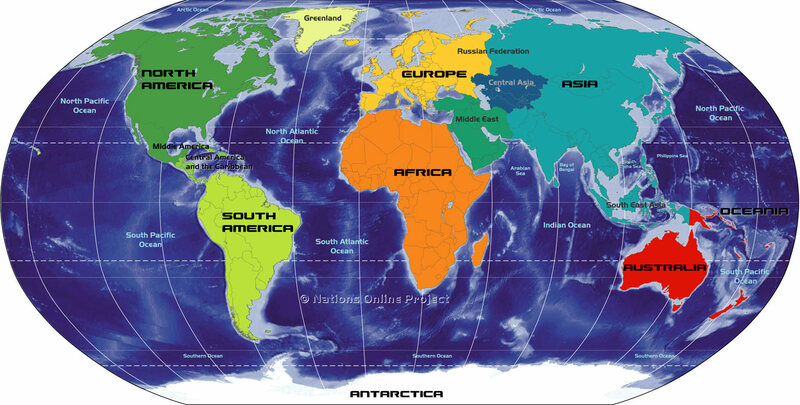 Map of the Continents and Regions is showing the location of Africa, the Americas, Antarctica, Asia, Australia/Oceania, and Europe. The Middle East, Central Asia, and South East Asia, which are regions. Greenland not official a continent, but the world's largest island. geographically, Kalaallit Nunaat (official name) belongs to North America, politically it belongs to Europe (Denmark). A list of all world countries and areas from A to Z with links to country profiles. List of Chinese Names of Countries in Simplified Chinese and Pin-Yin spelling. Made to improve cross-cultural understanding and global awareness.